Instead of showing the default logon, logoff and shutdown status messages you can enable detailed messages that will tell you exactly what is going on. Wondering what is taking your logon so long? With detailed messages turned on you will see messages like Processing group policy and other specific tasks Windows Vista is executing. Click on the start button and key in gpedit.msc and hit Enter. When the Local Group Policy Editor has loaded, navigate through Computer Configuration, Administrative Templates and select System. 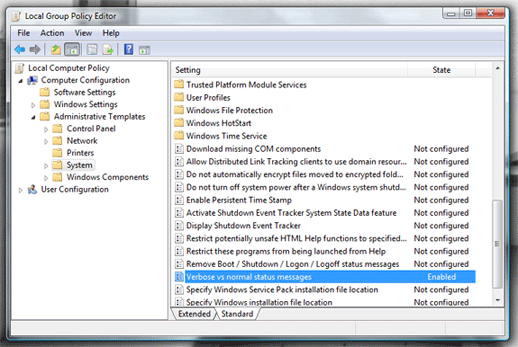 Locate the Verbose vs normal status messages policy, right click and select Properties. Select Enabled and hit OK. Enjoy your detailed status messages!